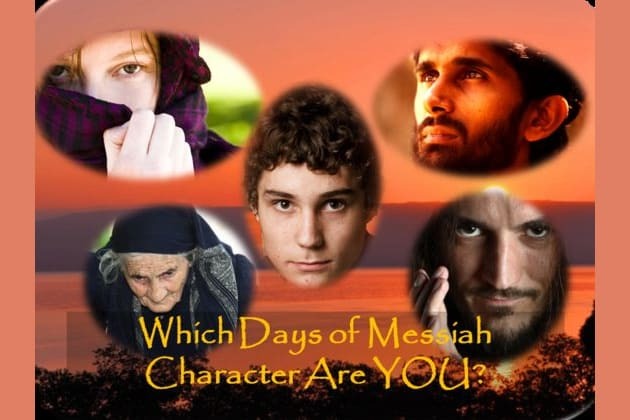 Which Days of Messiah Character Are You? Your friend or family member is being bullied and comes to you for help. How do you respond? Jump the bully in a dark alley. Make him afraid to hurt anyone ever again. Plot ways for your friend/family member to catch the bully off guard and teach him a lesson he won't forget. Tell your friend/family member to stand up to the bully, and then go with him in case he needs backup. Throw yourself in the middle and get the bully to pick on you instead. Failing to achieve what you want. If you stood at the foot of Jesus' cross, what would your thought be? It's not my fault, not my problem. Who did this? I'm going to kill them! How can He hang there when He is the son of God? How could they do this to such a good man? I hate this. I have to get away from here. So this is Roman justice? When you get angry at someone, what is your first impulse? Glare. They'll get the idea. Try to understand them. Everyone in this harsh world is hurting. Cry. But only when no one can see me. Get them out of my life. Wait in the background until you decide who is right. I have achieved a good measure of success. I have made strides toward justice in the world. I have upset every town in the country. When I've had my fill of what this world has to offer. I have raised a loving family. I have made a difference in the life of a person. You are not afraid to stand up for what is right, no matter the cost. You care about your family, but nothing can keep you from following the call in your life. You hate tyranny and oppression and will defend those who are weaker than yourself. But your calling may not be what you think it is. It may be something greater. You are caring, and you will sacrifice your own happiness and well being for your family and those you care about. You hide your pain and suffer in silence because you don't want to be a burden to others. You're a very passionate person with a lot of heart, but you are often taken for granted. But one encounter with Jesus Christ will change your whole life. Learn more about your character in book 1, The Healer's Touch. You are a driven person. You have things to do, people to see, and no time for setbacks. You know where you're going, and you're ready to get there. You enjoy work and business. When things in life go wrong, you shoulder the load and make the best of it. You are a skeptical persona and don't believe everything you hear. You verify facts for yourself, and must see it to believe it. Your family is important to you, though they may never know how much. You'd give anything to protect them. But that anything may be more than you ever dreamed. Find out more about your character in book 2, The Messiah's Sign. You are a kind hearted person who seeks to bring light into the lives of others. You have a quiet strength that others lean on. You believe every circumstance has a positive side, and you look to that. You enjoy serving other people, and the rewards that you reap from that are priceless. Who will you inspire with your heart of gold? Find out more about your character in book 1, The Healer's Touch. You've learned that life is tough, and you seek to look after number one. After all, if you don't look out for yourself, you'll be run over. You know what you want, and you'll stop at nothing to get it. You seem to have surprising good luck, and things just turn out your way. But in the end, you may find that there is something greater than yourself. Find out more about your character in books 2 and 3, The Messiah's Sign & The Master's Calling. You have a strategic mind, and you enjoy studying history and military tactics. You are a wise councilor to your friends, and are willing to help them wage their battles. You're pretty laid back, but don't mistake that for weakness. You enjoy seeing justice win out. But you may discover that so-called justice may not always be right. Discover more about your character in book 3, The Master's Calling.